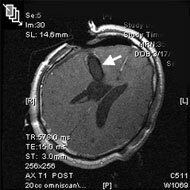 A pre-operative MRI image (above) shows an ependymoma (arrow) in the right lateral ventricle. The port tract (arrow) is visible on the MRI taken in the Intra-Operative MRI Suite. This MRI shows complete removal of the tumor. This post-operative MRI (above) confirms image-complete removal of the tumor. Ependymomas are tumors that arise from a thin layer of cells that line the ventricular walls and central canal of the spinal cord. 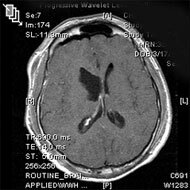 Ependymomas are a type of glioma, along with astrocytoma and oligodendroglioma. These tumors can occur anywhere in the brain or spinal cord. The most common site in the brain is at the bottom of the brain near the spinal cord. These tumors have the potential to spread through the cerebrospinal fluid (CSF) to other areas of the nervous system. UCLA offers a multidisciplinary management of ependymomas, with experts in neurosurgery, radiation oncology, and neuro-oncology working closely together to assure the highest quality of care. Your UCLA neurosurgeon will determine with you how much of the tumor can and should be removed. If the tumor is surgically accessible, a "complete" removal is attempted. Sometimes, ependymomas are best removed with the aid of intra-operative MRI, allowing the most complete, safest surgery possible. The UCLA Neuro-Oncology Program offers the latest in promising medical therapies available.